After spending two months in Manhattan, it would be an understatement to say I was in dire need of a bit of nature. 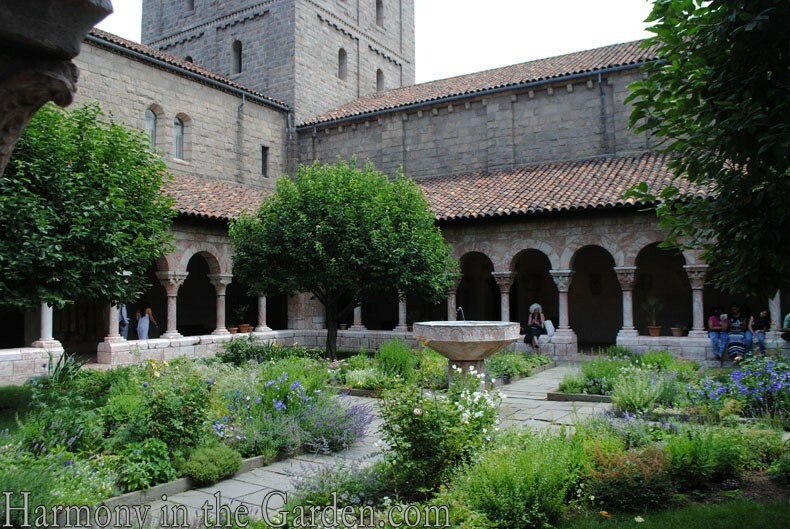 So one day last week, I hopped on the subway to the very edge of the city to explore The Cloisters (a branch of the Metropolitan Museum dedicated to Medieval art). While I’m not necessarily a die-hard for this era of art, I did want to see the two Medieval gardens located in the center of the museum. Once the long subway ride ended, I trudged up the flight of stairs and instantly felt like Dorothy in the Wizard of Oz – you know, when her house lands and she opens the door to technicolor Oz? I was instantly transported to another place – one filled with lush, old-growth trees and wide open spaces leading to breathtaking vistas of the Hudson River. Surely I couldn’t be in New York any longer? Following the sign to The Cloisters, I decided to walk rather than take a short bus ride. Definitely one of the best decisions of the day as I had no idea that one of the highlights would be the 3-acre Heather Garden, which you pass through on your way to the museum. 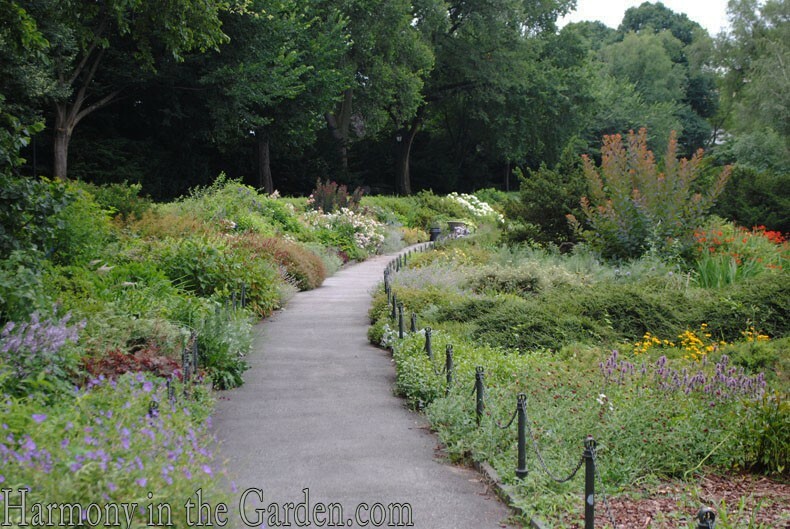 Originally created in 1935 by the Olmsted Brothers (yes, the Frederick Law Olmstead of Central Park), the Heather Garden was originally planted with over 50 varieties of heaths and heathers designed to bloom in Spring and Summer. 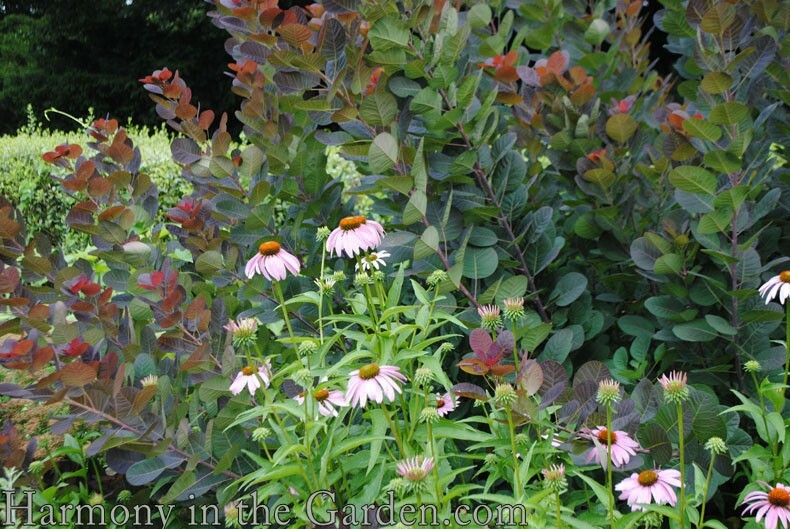 Luckily, it has since been re-worked by one of my favorite New York garden designers, Lynden B. Miller (you can see more of her jaw-dropping designs in an upcoming post) along with Ronda M. Brands. 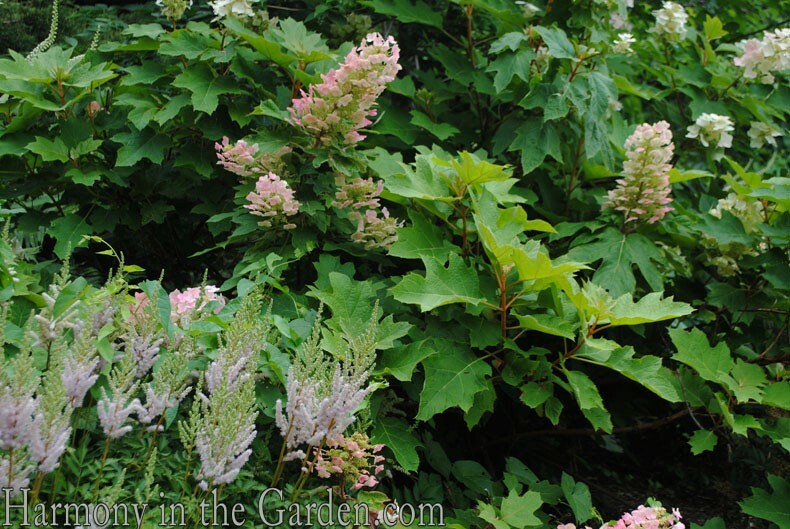 Since it’s update, Heather Garden now includes a 600-foot perennial bed overflowing with one knock-out combination after another. 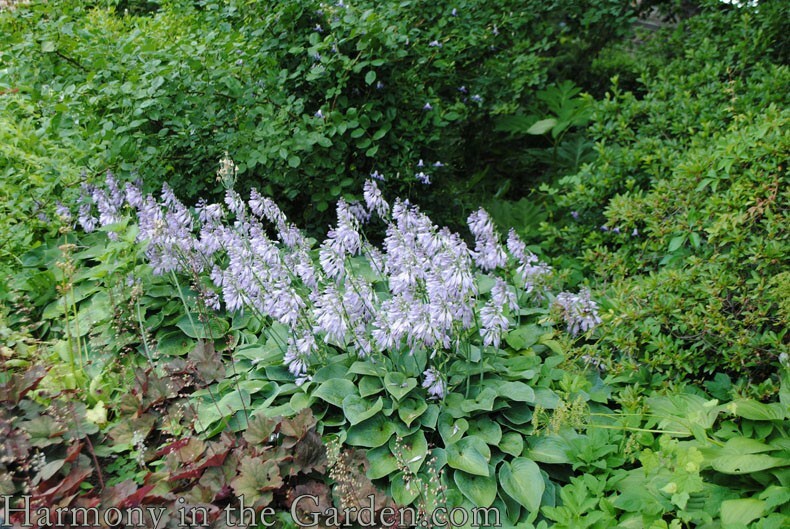 In this garden grasses, shrubs, perennials and bulbs intermingle in such a way to create a casual yet controlled feel. Subtle color, texture and form echoes gently transition from one color scheme to the next as they lead you down the path. Even calm and monochromatic combinations sing with harmony thanks to the creative blend of foliage sizes, shapes and shades of green. I could’ve easily spent my entire day wandering through this delightful garden, taking one close up after another, but I needed to keep moving. 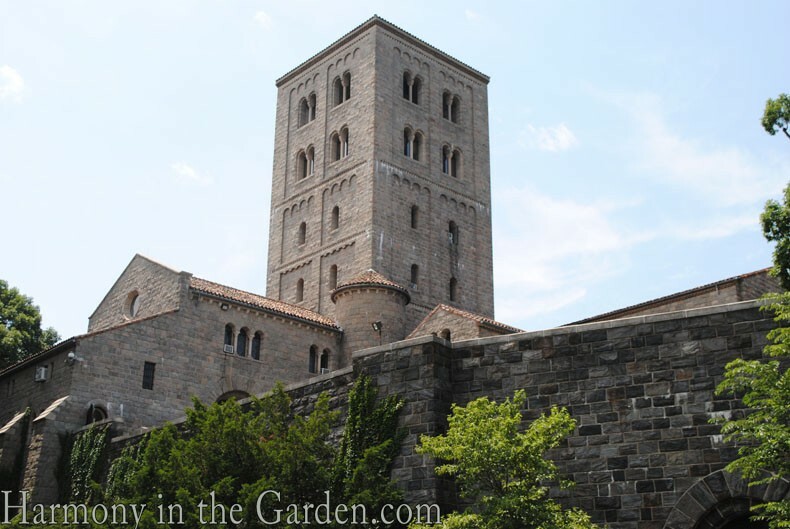 When I finally arrived at The Cloisters I definitely felt like I was in a different land altogether. Built in 1938, the building itself looks like it was plucked from Medieval France and placed on this 4-acre hilltop. Housing some of the most impressive collections outside of Europe (have you seen the unicorn tapestries? They’re here! 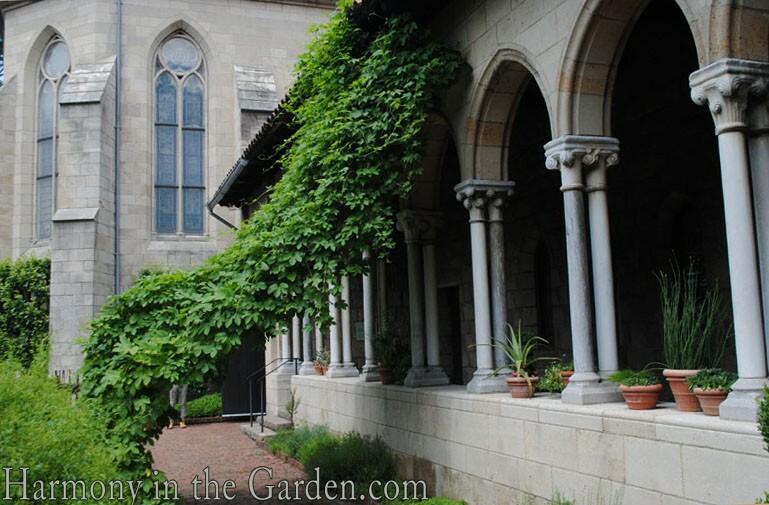 ), I spent a bit time in the museum but soon headed out to find the 2 cloistered gardens contained within. This definition perfectly fits the Cuxa Cloister, as strolling through it makes you feel like you’re in an ancient 12th-century monastery. 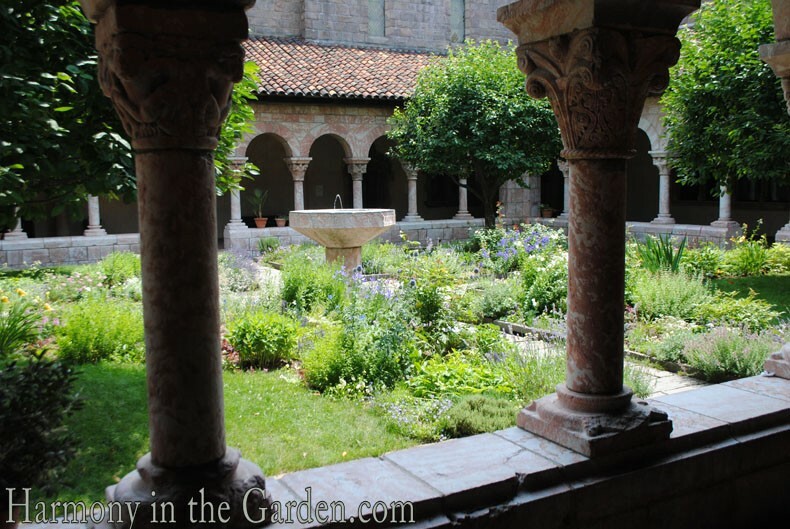 Originally part of a larger Benedictine monastery in the Northern Pyrenees, this French-Romanesque garden features crossed paths that form quadrants of lawn surrounded by four perennial borders. Where the paths meet in the center is a stately fountain (irresistible to children and English sparrows alike!) Contained within each quadrant is a Crape Myrtle tree, casting much needed shade in this hot and sunny area. 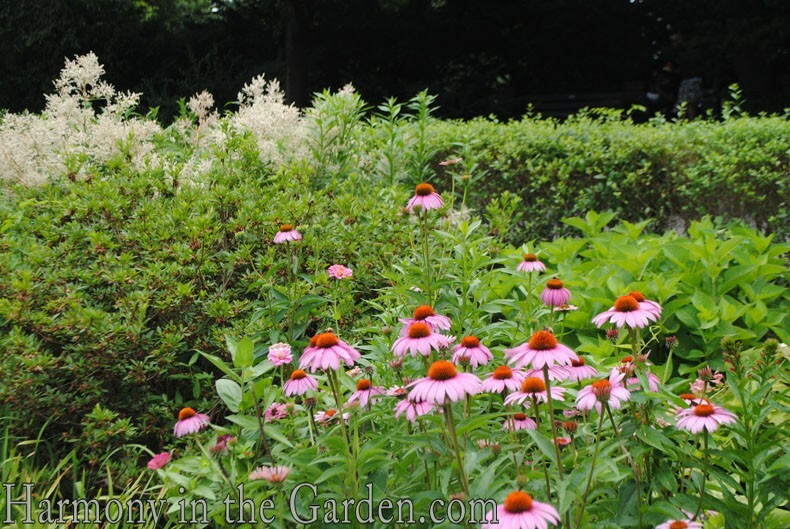 Unfortunately, I don’t have many other photos of this garden as the perennials and herbs seemed to be struggling a bit in the intense heat of the day. 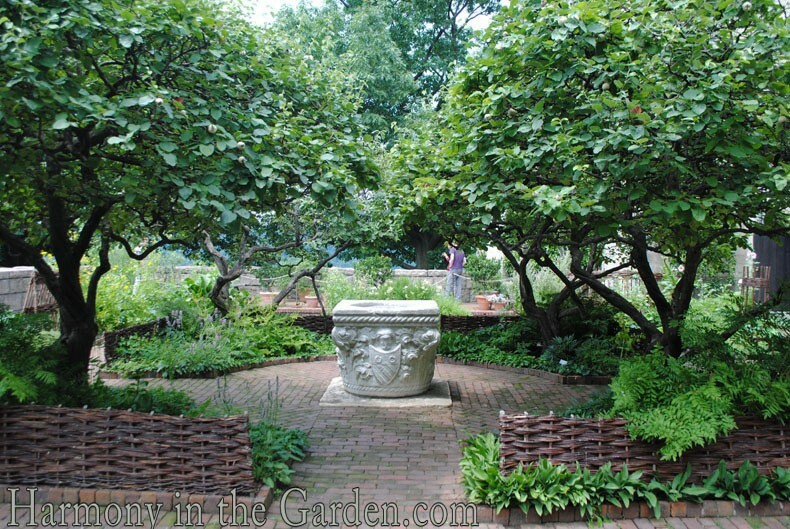 This gothic period garden, however, with a Venetian well head in the center, was my favorite. 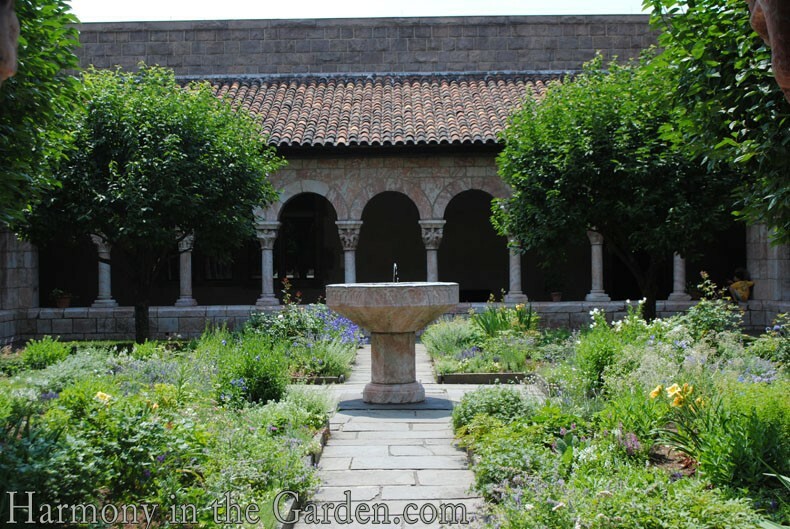 Originally from a 12th-century Gothic abbey in the south of France, this cloister garden (with a Venetian well head in its center) contains plants that would have been found in a typical medieval garden. Similar in layout to the Cuxa garden, this too has four main paths radiating from its center, with a beautiful quince tree within each quadrant. 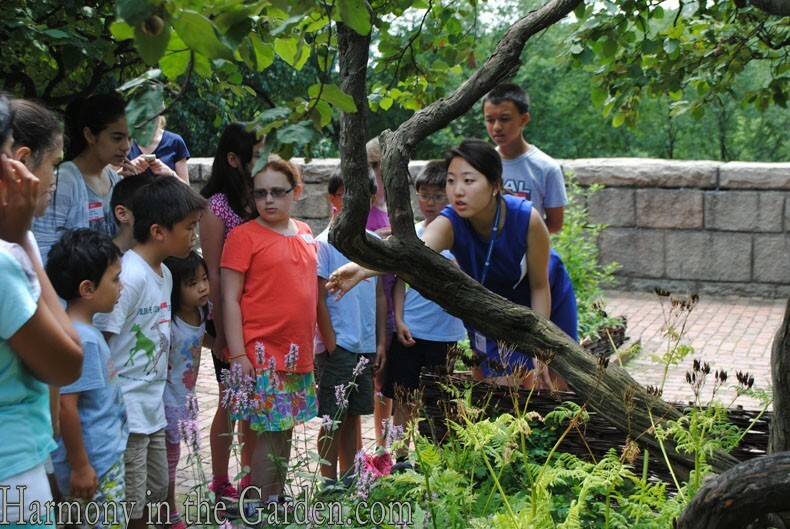 The plants in this garden, however, are grouped according to their general use: Culinary, Medicinal, Brewing and Art. Just look at this hop vine! Trained to grow over the roof, this 15-year old vine is a favorite among the staff, who even have a video dedicated to its lightening-fast growth pattern. 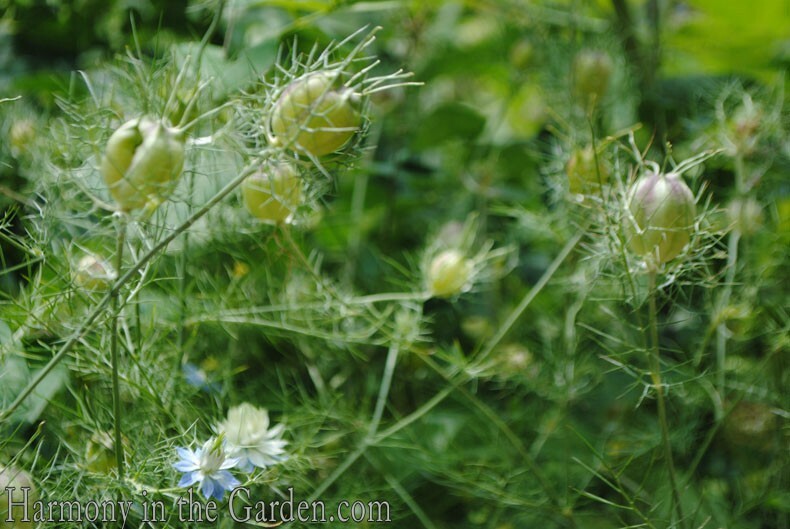 Other plants in the brewing garden are Bachelor Buttons (Centaurea cyanus) which were used to brew a mint-like tea, as well as licorice (Glycyrhizza glabra) and mint. 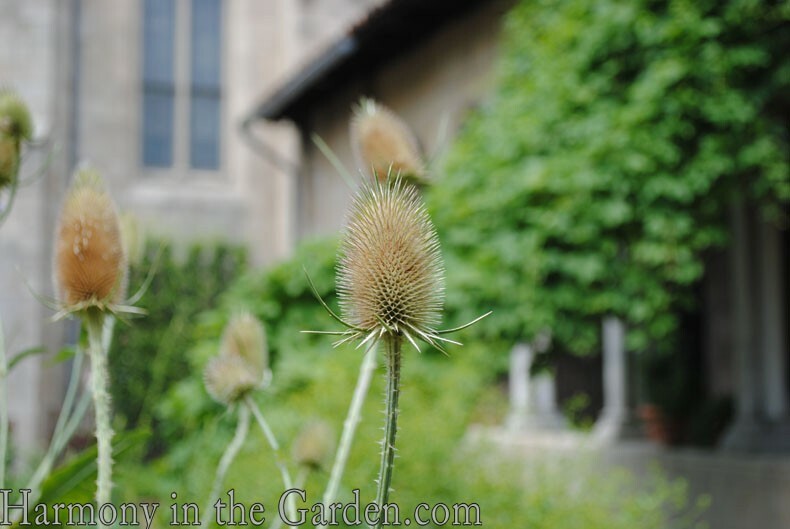 A common weed known as Fuller’s Teasel (Dipsacus sativus) was vital to creating wool and tapestries, and in fact, are still used today. The spiny seed heads were used to tease out woolen fibers before they were spun and then again in raising the nap of finished woolen cloth. 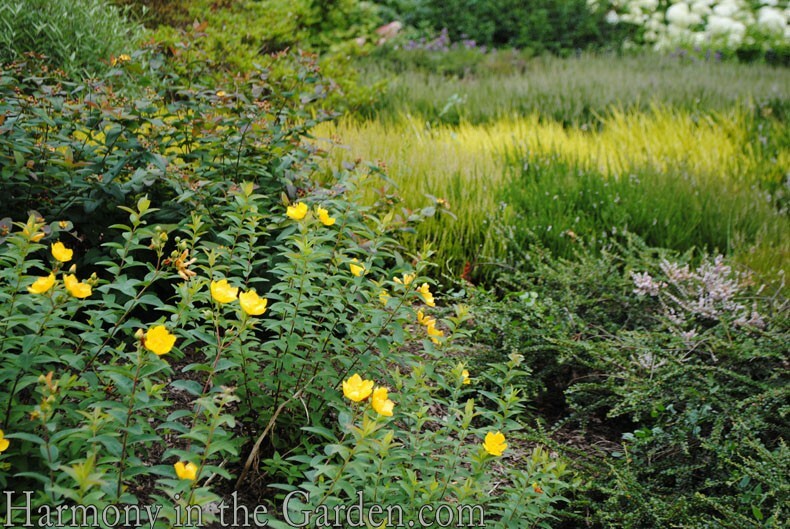 Also growing in this garden (and clearly a favorite among the kids on this tour) was Celandine (Chelidonium magus). The guide is passing around a sample of the yellow ‘blood’ the stem emits when crushed, which was used as a less expensive alternative to gold gilding in medieval manuscripts. 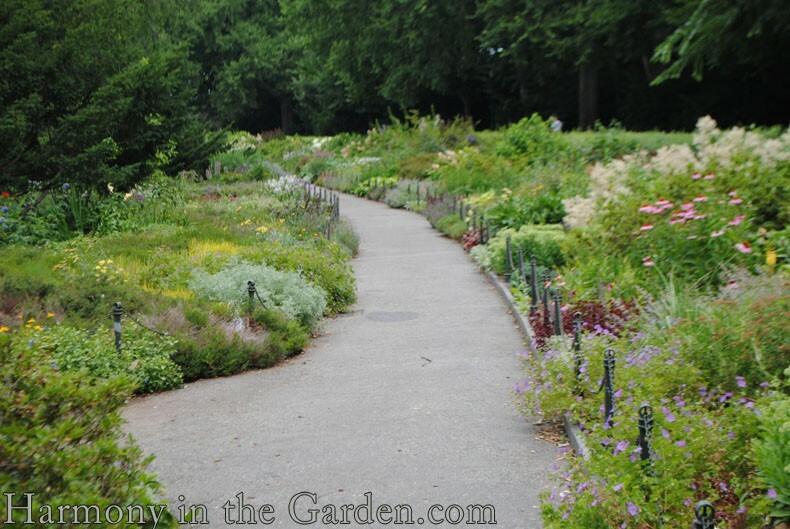 Probably my favorite of the four gardens, this one was filled with plants I was a little more familiar with, except for their healing properties which were new to me! 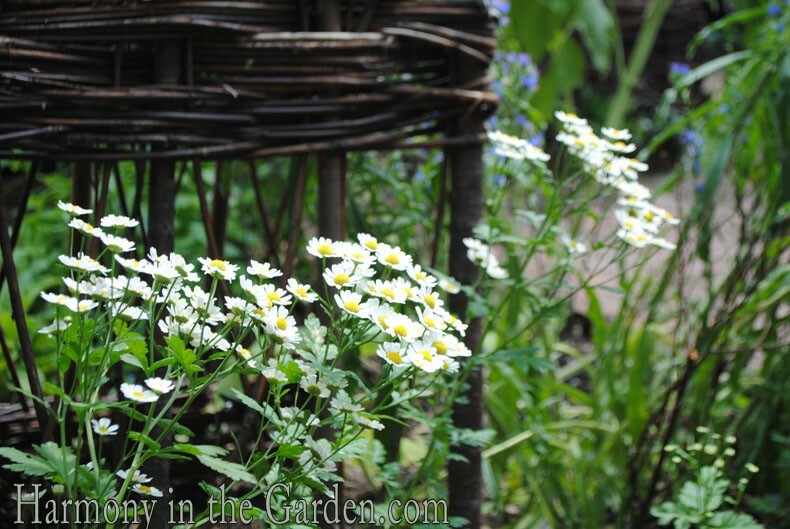 Or this Feverfew (Tanacetum parthenium) which is one of my favorites that freely grows in my own garden (I’ve previously written about it here). 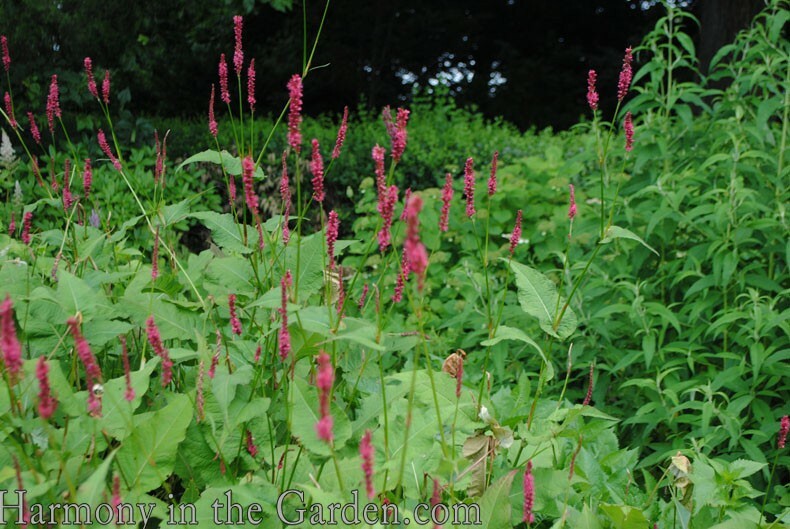 Did you know this herb was used to stuff into pillows to help bring down a fever? Or that it was considered helpful in preventing migraines? 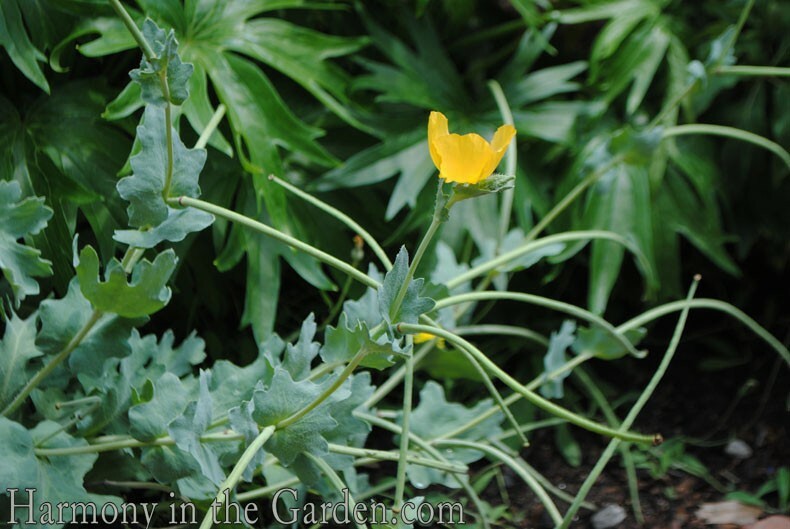 Earlier this year I planted three Yellow Horned Poppy (Glaucium flavum) in my own garden as they’re very drought tolerant and produce interesting ‘horns’ along with their orangey-yellow flowers. 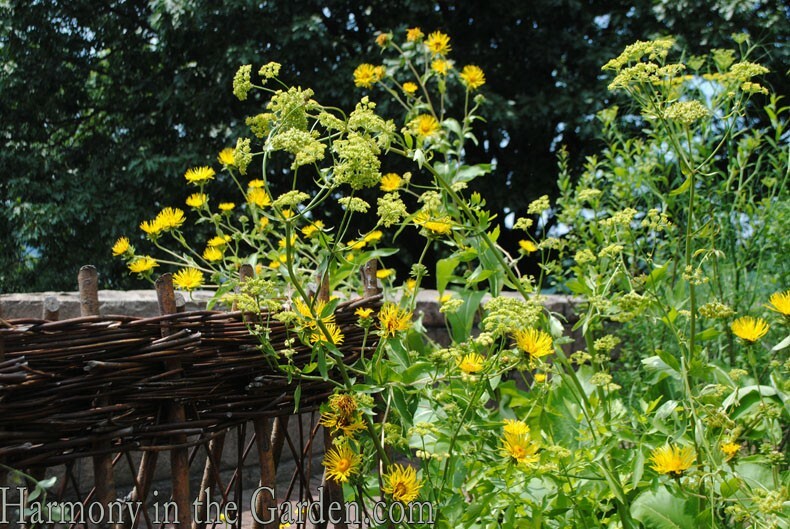 But I didn’t know that it was also once used to help prevent jaundice as well as having anti-inflammatory properties. 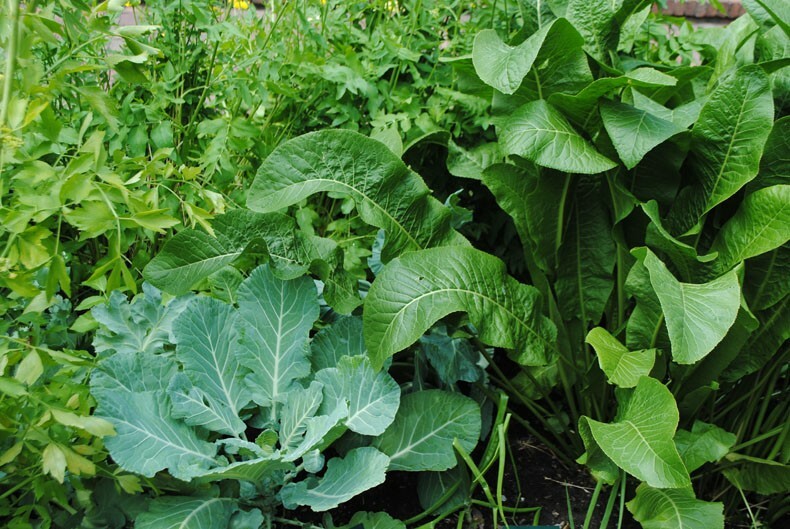 As to be expected, this garden was filled with herbs, cabbages and lettuces that I would’ve assumed would have been eaten in past times. But I had no idea that this particular kale, known as Sea Kale, was a mainstay in the everyday Medieval diet – commoners and royalty alike. 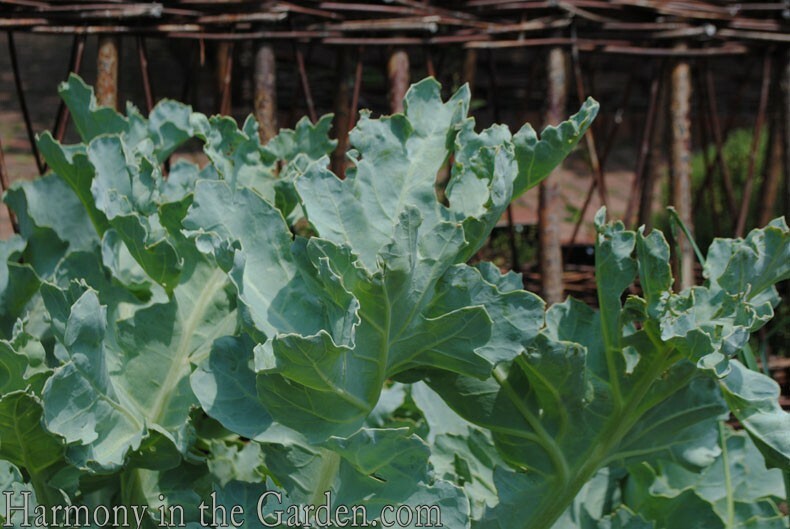 Unlike the tightly packed heads of cabbages and kale we see today, the original Colewort was much looser in form. 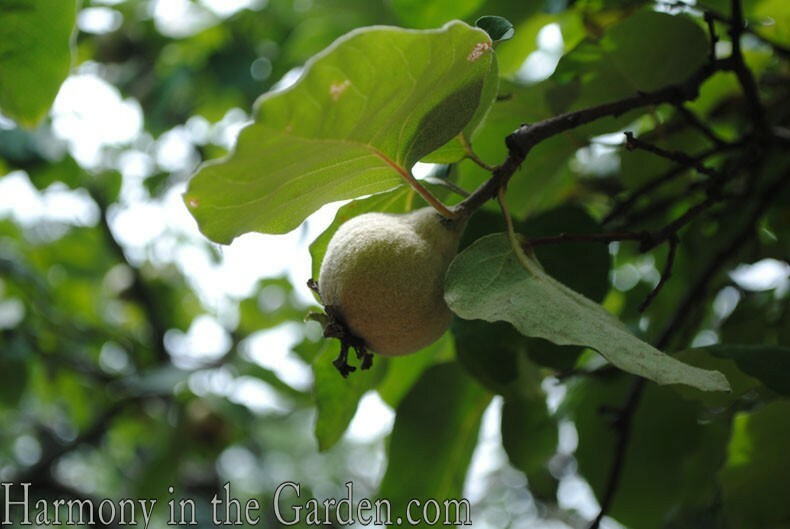 If you’d like more information on this garden and the plants contained within, the museum has a really well-written and fascinating blog where you can easily spend a few hours lost in historical facts! 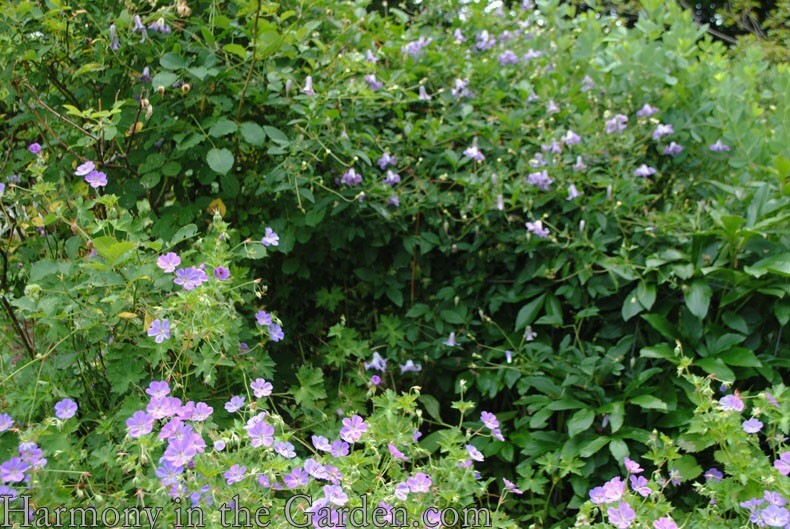 Welcome to my blog, Deb! 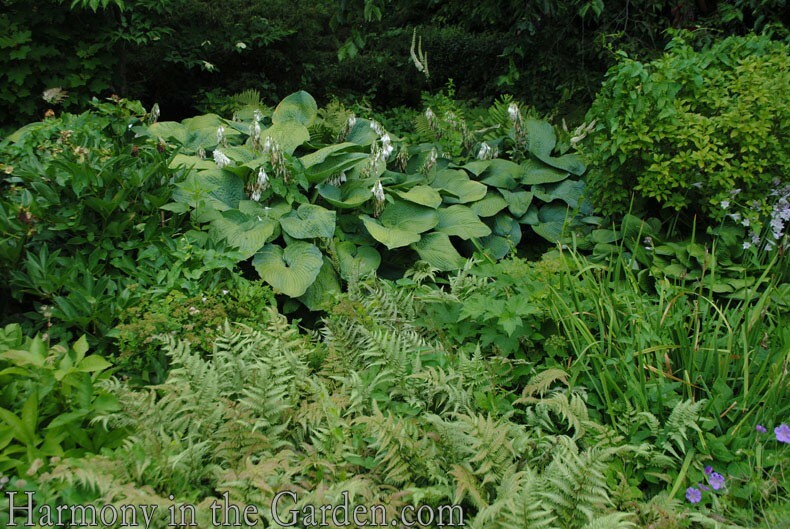 And how lovely to have a blank slate, lakeside garden. Oh, the things you can do! 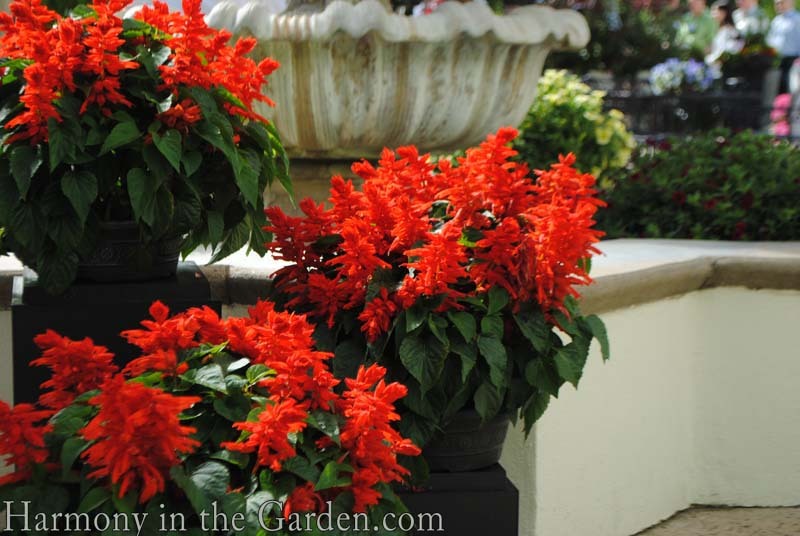 Have fun with your new garden and please keep in touch with its progress! I agree, Cathi – they tend to be the most interesting sometimes, don’t they? Wonderful post! I definitely felt like I was transported to a different place and time. Love the Dorothy in technicolor OZ analogy…Rebecca in Cloisterland.